the monster is on the grass mountain range. it is facing right. the enormous transparent sphere is a couple of feet to the right of the monster. 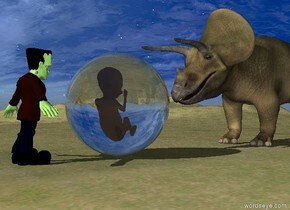 the huge dinosaur is to the right of the sphere. it is facing the sphere. the enormous fetus is 7.5 feet in the sphere. the pig fits on the small pedestal. the pedestal is on the shiny matisse mountain range. 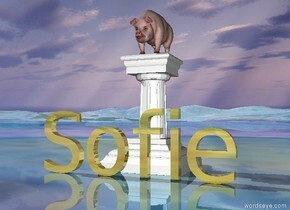 The gold "Sofie" is several inches in front of the pedestal. 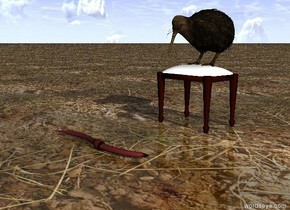 the small shiny table is on the grass ground. the [nicole] mug is on the table. it is cloudy. the extremely tiny kangaroo is a couple of inches to the right of the mug. it is facing right. 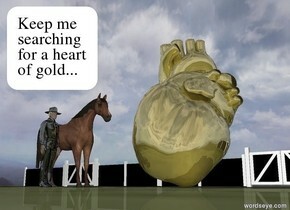 the horse is a few feet to the left of the humongous gold heart. it is facing the heart. the fence is 10 feet behind the horse. it is 50 feet wide. the ground is grass. the black shiny man is in front of the horse. he is facing the heart. the ground is dirt. the [moon] image is on the huge cube. 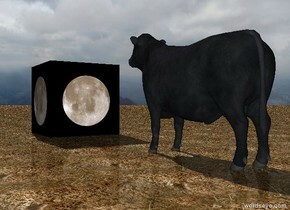 the cow is several feet to the right of the cube. it is facing the cube. 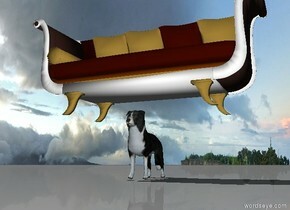 the couch is on the small dog. the shiny plate is on the [pattern] table. 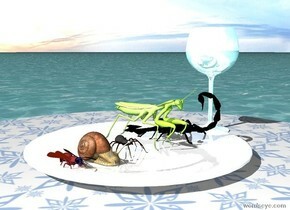 the 5 bugs are on the plate. the water glass is to the right of the plate. it is cloudy. the ground is water. a large fish is on the shiny [stars] ground. it is cloudy. the white dinghy is 6 feet in front of the fish. the very small man is in the dinghy. he is facing backwards. 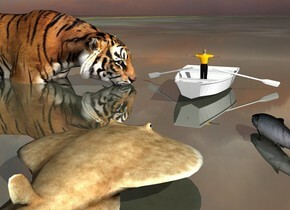 the huge tiger is to the right of the boat. it is in the ground. it is facing the man. 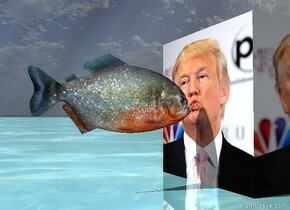 the 2nd large fish is 6 inches to the left of and in front of the fish. it is facing the man.